The mummy of Maatkare was found contained within a nested set of two coffins. She had also been covered by a coffin board. 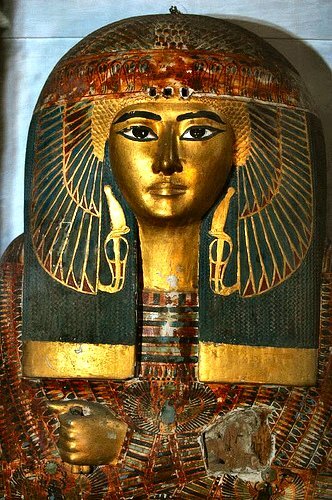 Unlike the undamaged outer coffins of Neskhons and Isiemkheb-D, Maatkare's outermost coffin had been partly plundered by thieves, who pulled off the gilded left hand and removed some type of decoration from just above the forehead, where three distinct holes appear indicating that something--perhaps a golden Uraeus serpent--had once been attached to the portrait mask at this position. 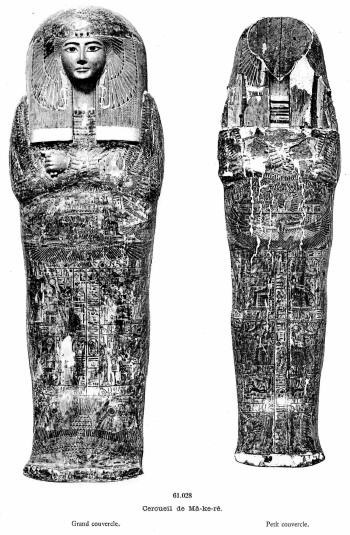 The inner coffin and coffin board sustained more extensive damage, and the hands and portrait masks of both have been completely removed. 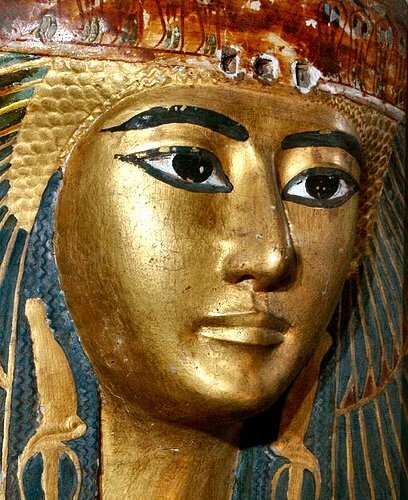 (a golden Uraeus serpent?) had originally been placed. CESRAS close ups of the the outer coffin's face. 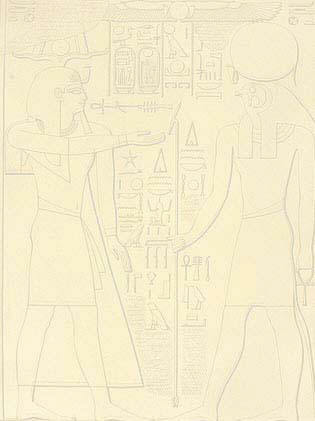 The Center for Egyptological Studies of the Russian Academy of Sciences (CESRAS) maintains an extensive collection of online images available for public use on Flickr. 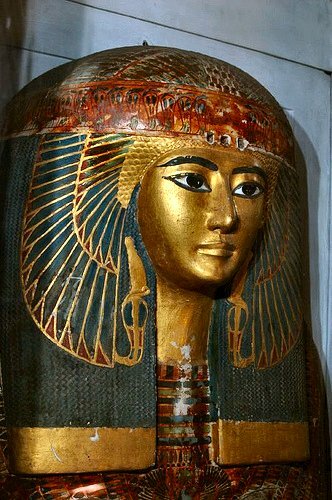 The above CESRAS color images of the outer coffin of Maatkare provide a valuable photographic record of this beautiful object, currently on display at the Egyptian Museum in Cairo. Additionally, CESRAS has posted large size scans of many of the photographic plates from George Daressy's historically important 1909 work, Cercueils des cachettes royales which are also featured on this page. Close page to return to 21'st Dynasty Gallery I or click here.